Just spotted this on Argos website, half price and in stock. Looks like Amazon but it's below the £20 free delivery threshold. Nice stocking filler for kids (big or little). For elite performance, elite distance and elite design comes the Nerf Strike Elite Stockade! 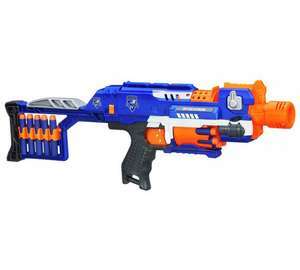 This dart gun has a motorised semi-auto-blaster rotating ten-dart barrel and removable stock with storage for darts. The stockade blaster fires 10 darts from a revolving barrel. Semi-auto firing – no cocking, just pull the trigger. Tactical rail is compatible with most n-strike accessories (sold separately). Store up to 10 darts in the removable stock. Stock is compatible with select n-strike blasters (sold separately). Launches darts up to 75 feet. Includes 10 elite darts, which work with any n-strike elite blaster and most original n-strike blasters. these are pretty naff, loud motor that has to be switched on rather than the 2 triggers of most motor nerf guns, pretty bulky, darts can drop out the drum and pretty weak to boot. stryfe is better and usually cheaper.